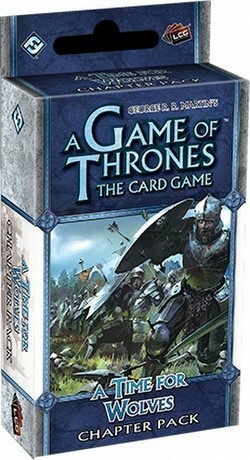 A Time for Wolves is the fourth Chapter Pack in the Wardens cycle for A Game of Thrones: The Card Game. A Time for Wolves introduces sixty new cards (3 copies each of 20 different cards) that ensure House Arryn and the Vale will soon make a massive impact upon A Game of Thrones: The Card Game. You will find no fewer than five cards with the House Arryn trait, including such notable characters as Petyr Baelish (A Time for Wolves, 77), Alayne Stone (A Time for Wolves, 71), and Lysa Arryn (A Time for Wolves, 76). Furthermore, as part of the Wardens cycle, A Time for Wolves adds more strength to decks that feature characters who cost four or more, more trait-based synergies, more interactions with the game's Castle plots, and more limited response abilities for you to trigger.